Property claims for wildfire damage can be managed when working together with our public adjusters. As your insurance company arrives with its team, it is important to have professionals on your side to develop a claim strategy to get your business back on its feet sooner. Our experts move efficiently to evaluate and document the full scope of your damages and negotiate a maximum claim settlement to get you up and running. If your commercial property is damaged in a wildfire, we understand your initial focus is on protecting your employees, operations, and customers. That alone can be a full-time job, as can be the next step of handling your commercial property insurance. When it is time to file a claim, your insurance company will provide its own adjuster to negotiate your property damage settlement. Who’s looking out for you? Our team of public adjusters will work on your behalf in the insurance claim process. As your trusted advisors, we are fluent with insurance policy terms and conditions. We will evaluate and document your property’s wildfire damage in full detail to negotiate with your insurance company for a maximum claim amount so you can get back to business sooner. What is covered for wildfire damage? 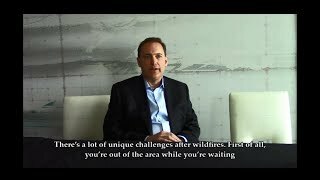 How has my insurance company handled past wildfires?